Lemons can do a lot more than serve as a garnish on a fish fillet or as a twist in a martini. They can gracefully and vibrantly hold their own as the starring flavor in many dishes. Here are four delicious ways to utilize and highlight this antioxidant-packed winter citrus fruit. This dish is particularly nice to entertain with because it can be almost completely prepped ahead of time. 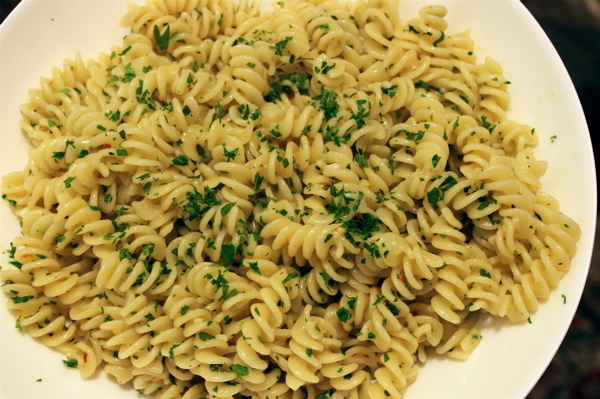 Serve alongside oven-roasted potatoes or with herbed lemon pasta (see recipe below). In a mini food processor, combine the lemon juice, lemon zest, rosemary, thyme and garlic. Gradually pulse in the olive oil until combined. Place the chicken thighs in a wide, flat dish and pour the lemon marinade over them. Massage the thighs to be sure they are fully coated in the mixture. Cover and refrigerator for at least two hours or up to 24 hours. 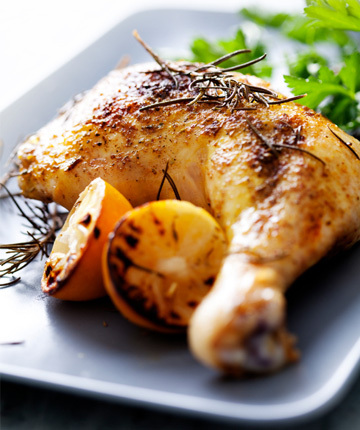 Preheat the oven to 425 degrees F. Arrange the lemon slices on the bottom of a baking dish and place a chicken thigh, skin side up, on top of each slice. Season the chicken generously with salt and pepper. Roast for 45 minutes to one hour, or until the skin is golden brown and the juices run clear. When I can find them, I use Meyer lemons in this dish. Meyer lemons taste like a cross between a lemon and a mandarin orange and impart a lovely, slightly sweet flavor into this dish. If you are not able to find Meyer lemons, regular lemons work just fine for this pasta recipe as well. Bring a large pot of heavily salted water to a boil. Add in pasta. While pasta is cooking, heat the olive oil over medium heat in a large saucepan. Add in the garlic and crushed red pepper and sauté until fragrant, about 30 seconds. Deglaze the pan with the white wine and reduce by half. Stir in the lemon juice and lemon zest. Drain the pasta, reserving at least a cup of the starchy cooking liquid. Add the pasta, Parmesan cheese and the fresh herbs to the saucepan and toss to coat. Stir in the starchy cooking liquid, a few tablespoons at time, if the sauce is a little dry. Adjust seasoning and serve. Any large oven-proof skillet will work for this shrimp recipe, but I like to use a cast iron skillet. Cooking in cast iron imparts great flavor into the dish and makes for a beautiful serving vessel. I absolutely love the flavor of lemon thyme in this dish, but if it’s not available, feel free to substitute it with regular thyme. Preheat oven to 450 degrees F. Heat a large oven-proof skillet on the stovetop over medium heat. Add the olive oil, butter, lemon zest and thyme to the skillet. 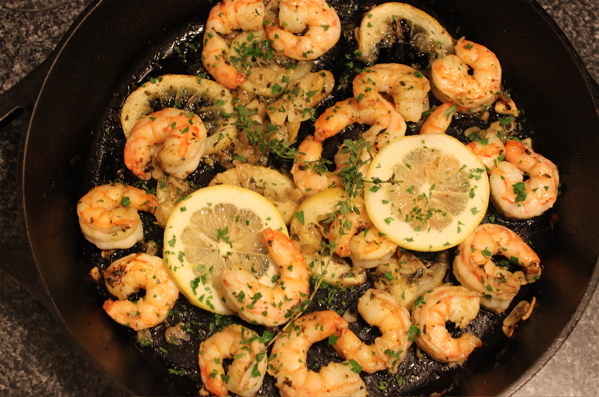 When the butter is melted and the oil is hot, add in the shrimp, lemon slices and garlic and stir to combine. Transfer to the oven and cook, stirring once halfway through, until the shrimp are just cooked through, about 10 minutes. Preheat the oven to 325 degrees F. Grease a 9 x 5-inch loaf pan and dust with cake flour. Tap out excess flour. Sift together the flour, baking soda and salt in a medium bowl. In a large bowl, beat the butter with an electric mixer over medium speed until fluffy. Gradually add in the sugar and beat for another five minutes. Beat in eggs, one at a time, followed by the lemon juice, lemon zest and milk. Gradually stir in the dry ingredients, until just incorporated (do not over mix). Transfer to the greased loaf pan and bake for about one hour, or until the top is lightly browned and a toothpick comes out clean when inserted into the center of the cake. 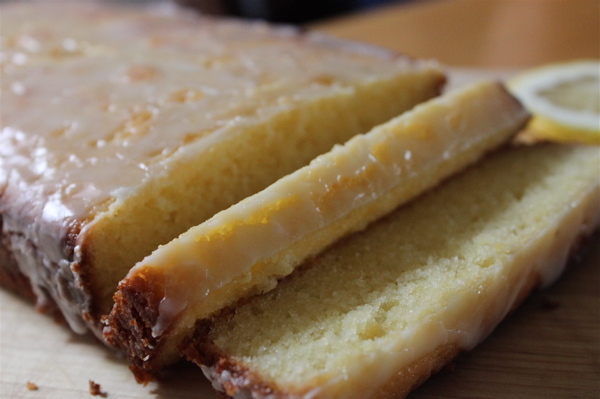 While the cake is baking, make the glaze by stirring together the confectioners’ sugar and lemon juice. Allow the cake to cool in the pan for 15 minutes and then transfer to a cooling rack. When it is completely cooled, pour the glaze over the top of the cake. Allow the glaze to harden before slicing and serving.